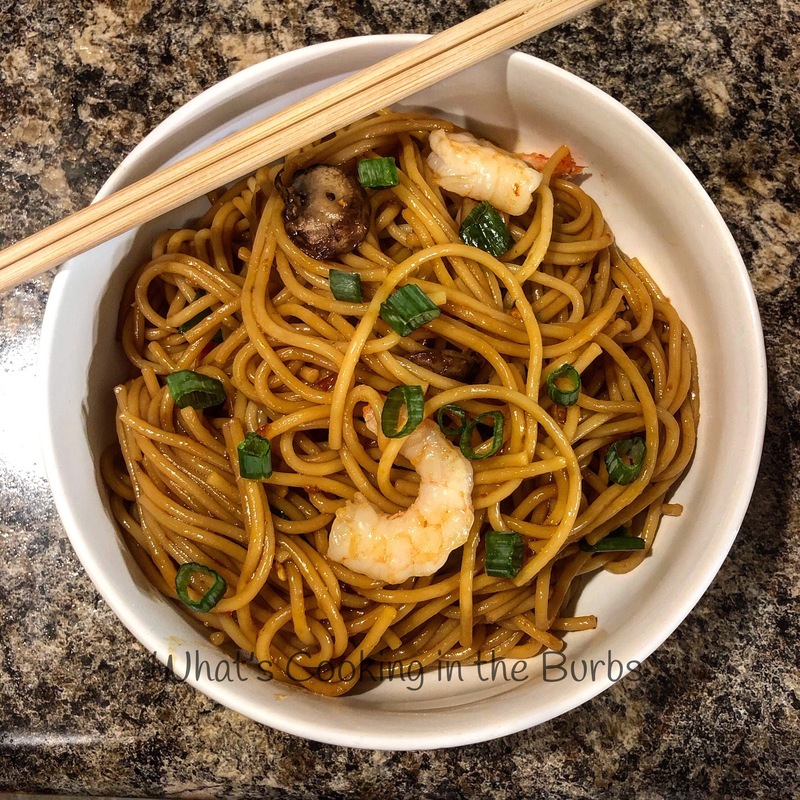 In honor of meatless monday, I decided on this spicy Kung Pao Shrimp and Noodle Bowl. I know some people may not agree with shrimp being considered a meatless monday option, but in my house we think it is! 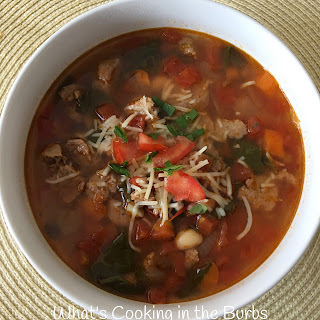 This meal is not only healthy, but will warm you up on a cold winter night! Cook noodles al dente according to package instructions. Drain and set aside. While the noodles are being prepared, heat 1 tablespoon oil in a large sauté pan or wok over medium-high heat. Season shrimp with a few pinches of salt and pepper, then add it to the pan. Cook for 3-4 minutes, stirring occasionally, until shrimp is cooked through. Transfer to a plate and set aside. Add Mushrooms and garlic to pan, saute for 4 minutes or until soft. In a seperate sauce pan combine the soy sauce , peanut butter, rice vinegar, and chili garlic sauce. Whisking until combined. Bring to a boil, reduce heat and stir in the cornstarch/water mixture. Return to a boil and once thickened and in the shrimp, veggies, and cooked noodles. Cook for 1 more minute until it comes to a simmer. Remove from heat and toss in the chopped green onions, serve immediately. Enjoy! Happy Hump Day! Anyone else waiting impatiently for the weekend? After my vacation last week I definitely need to detox and get back on track so I decided to make one of my healthy favorites for dinner tonight! 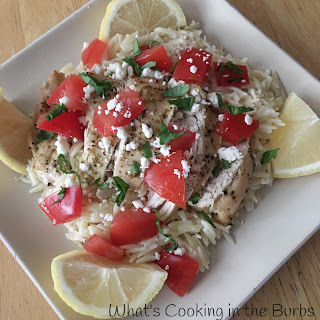 Greek Lemon Chicken. I'm obsessed with Orzo lately, and what goes great with orzo? Yep, Greek Chicken! Combine the two and you've got a fresh and flavorful meal that is healthy and easy! My kind of weeknight dinner! Arrange chicken in bottom of crock pot. Add remaining ingredients, except for tomato, feta, and onion. Cover and look on low 3-4 hours. Sprinkle with feta cheese, tomato, and onion and serve with fresh lemon. 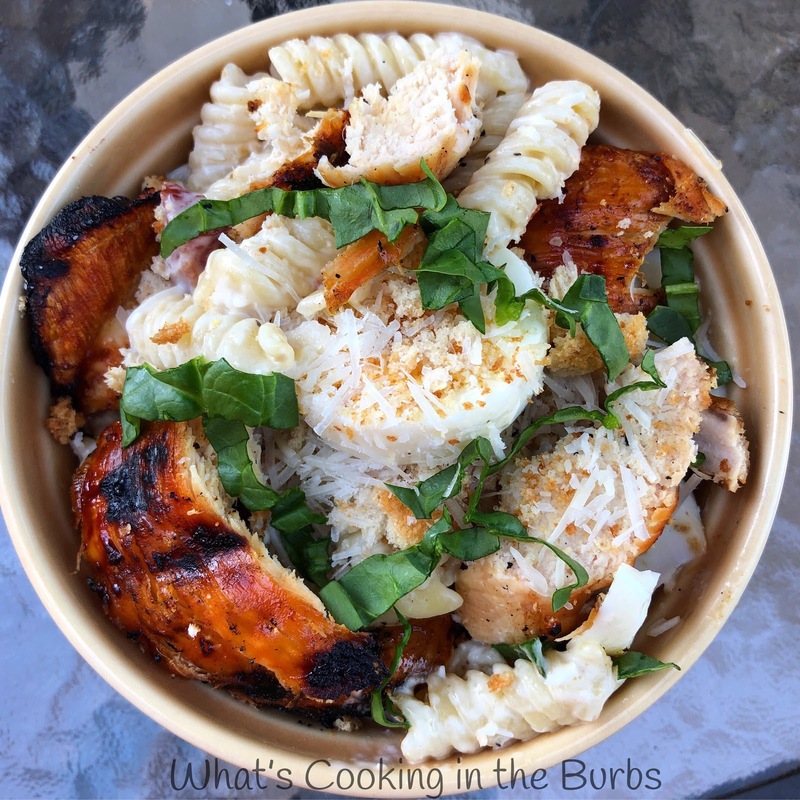 Enjoy over orzo or rice! I know it's been forever (literally) since I've posted a recipe. Has it really been since July? Summer has come and gone and now in my neck of the woods it is flat out COLD! With these chilly temps we've been having I decided I needed a hearty yet healthy, meal to warm us up and this Spicy Italian Sausage and White Bean Skillet was the perfect dinner. I used turkey sausage to keep the calories down so it is healthy and weight watcher friendly. A win/win in my book! Remove the casing from the sausage and add the sausage to a large deep skillet, and Sauté the sausage over medium heat, breaking it into pieces as you go, until the sausage is cooked through, brown, and crispy on the edges (about 10 minutes). While the sausage is cooking, rinse and drain the cannellini beans. 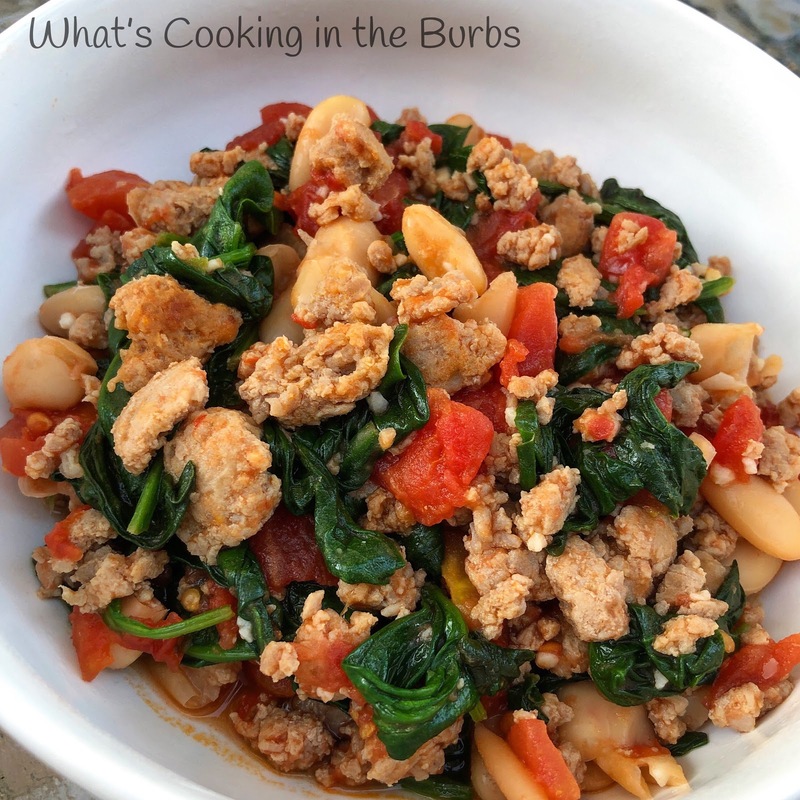 Once the sausage is browned add the beans, garlic, and spinach, stirring until wilted. Next add in the diced tomatoes and salt/pepper. Simmer until heated through. Top with fresh grated parmesan if desired. Enjoy! 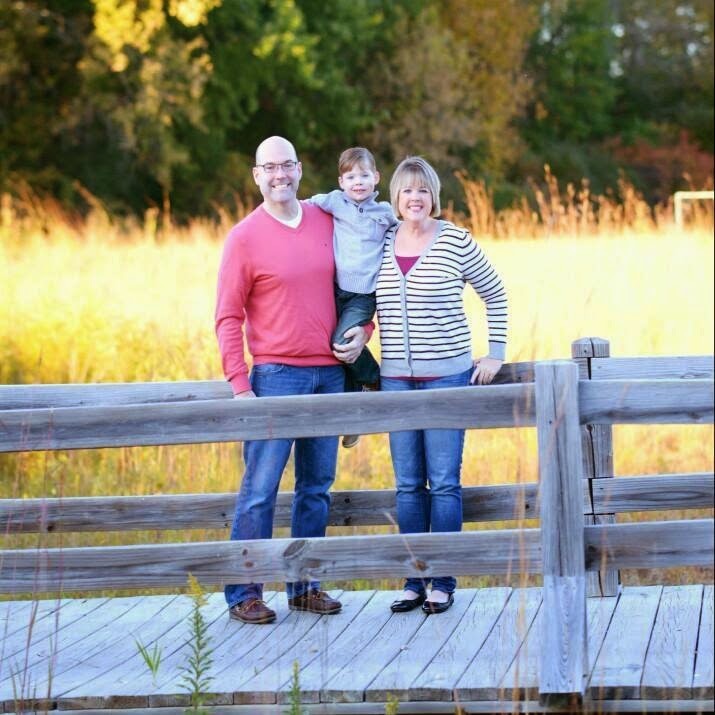 I've been slacking when it comes to posting on my blog lately and here it is the middle of July and summer is just flying by! I have a couple of recipes that I've been meaning to post but haven't gotten around to it until now. 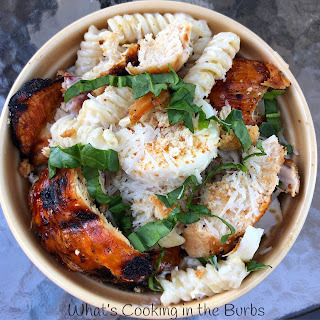 I love a good Caesar Salad but wanted to make it more hearty for dinner so I decided on this Creamy Chicken Caesar Pasta Salad. Super easy and super yummy! Season chicken with garlic powder and grill 5-7 minutes per side over medium heat or until juices run clear. Slice and set aside. Toss pasta, dressing, bacon, eggs, and lemon juice together. Combining well. Top with sliced chicken, croutons, and cheese. Enjoy! 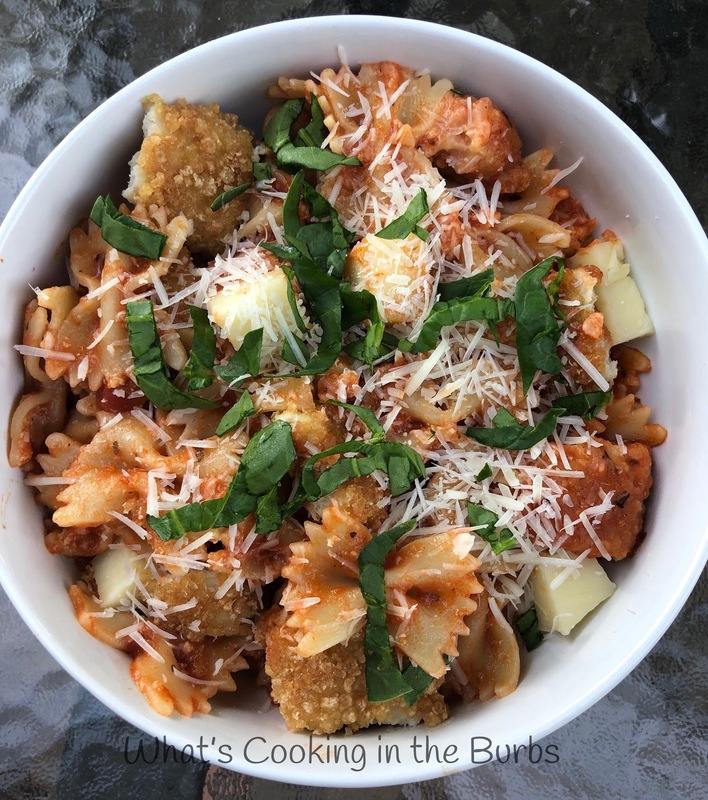 In a small bowl combine grated parm and bread crumbs. Dip chicken pieces into egg mixture. Dip into cheese/breadcrumb mixture and place onto a foil lined baking sheet. Bake for 20 minutes or until golden brown and chicken is cooked through. Remove from oven and toss with hot cooked pasta, sauce, and cubed cheese. Top with fresh basil and more parmesan if desired. Enjoy! I'm pulling this recipe up from the archives. It's an oldie but a goodie! 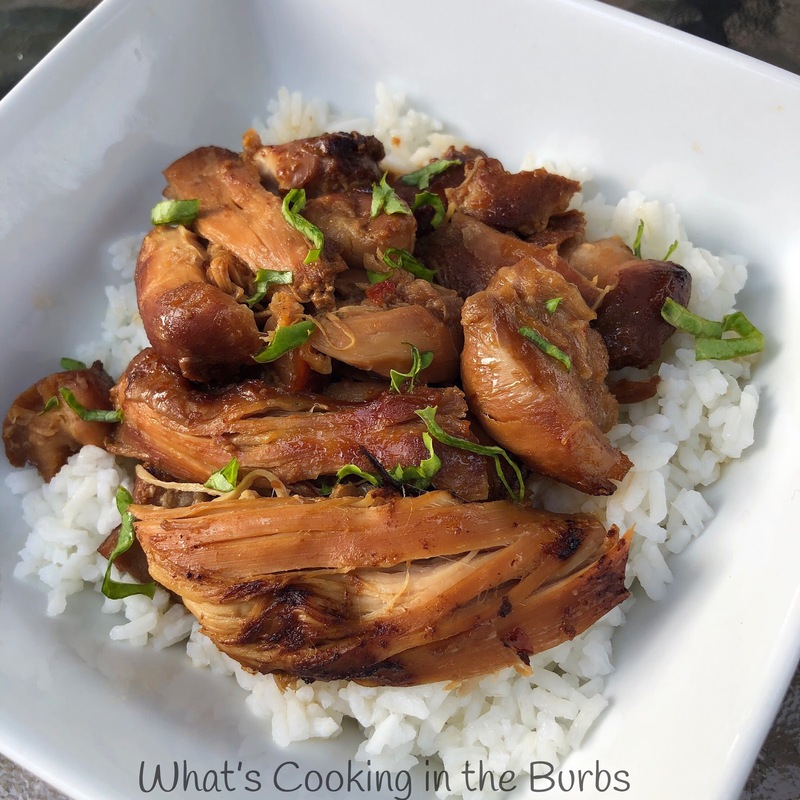 My version is without the actual "Bourbon" and calls for boneless skinless chicken thighs but you could always sub chicken breasts if you wanted to lower the calories. Either way it's delish! Arrange chicken in the bottom of the crock pot. Meanwhile whisk remaining ingredients together and pour over chicken. Cover and cook on low 3-4 hours. Break chicken into pieces and top over hot cooked rice. Enjoy!